The 2008 25-man roster prediction is based only on players currently within the organization and will be updated when trades are consummated and free agents are signed. 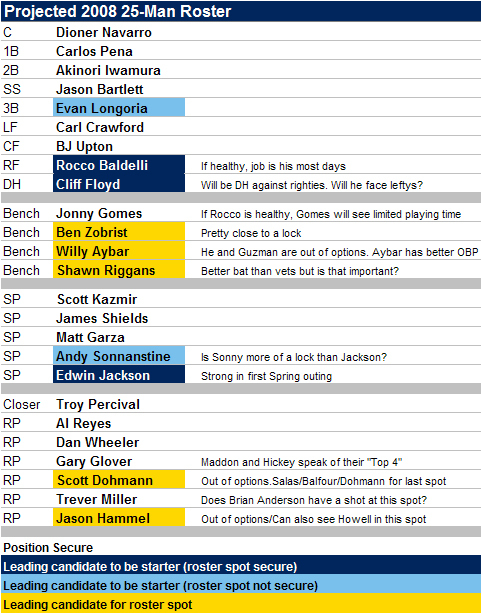 With Spring Training games underway, let’s update our 25-man roster projections with a couple of changes. Lineup: We know that we keep going back-and-forth, but now our gut is saying that Evan Longoria will start the season with the Rays. We don’t think it will take long for Joe Maddon and Andrew Friedman to realize that The Dirtbag is the best third baseman in camp, on the field and off. Cliff Floyd is going to be the DH most days and if healthy, Rocco Baldelli will be in right. That means limited ABs for Jonny Gomes, who needs regular ABs to be effective. If Aybar can play the outfield, the Rays may look to trade Gomes before opening day. Bench: If Evan Longoria makes the team, and Jonny Gomes is not traded, that leaves one spot for Willy Aybar and Joel Guzman. Both are out of options. One will need to be traded or released. Guzman may have more value on the trade market right now. Joe Maddon keeps telling us that Shawn Riggans is the favorite to be the backup catcher, so he gets the edge right now. Seems surprising consider the team repeatedly stated they wanted a veteran backup catcher and have two in camp. Rotation: Andy Sonnanstine is technically battling for a spot, but he would have to be awful this spring to not get a job. Edwin Jackson looked solid in his spring debut this morning which gives him an early leg up on the competition. Our feeling is that JP Howell and Jason Hammel are longshots at best. Jeff Niemann is the darkhorse that could force Jackson to the bullpen or to another team. Bullpen: Five spots are locked. One spot will likely go to one of the odd-men out of the rotation. That leaves one spot and a number of names. Juan Salas, Grant Balfour, Brian Anderson and Scott Dohmann. Salas is still in the D.R. and his clock is running out fast. Balfour is a longshot. Dohmann is the early leader, but there have been positive reports from veteran Anderson.